Chore Charts For Kids - Printable Chore Charts that Work! Chore Charts for Kids – Printable Chore Charts that really Work! 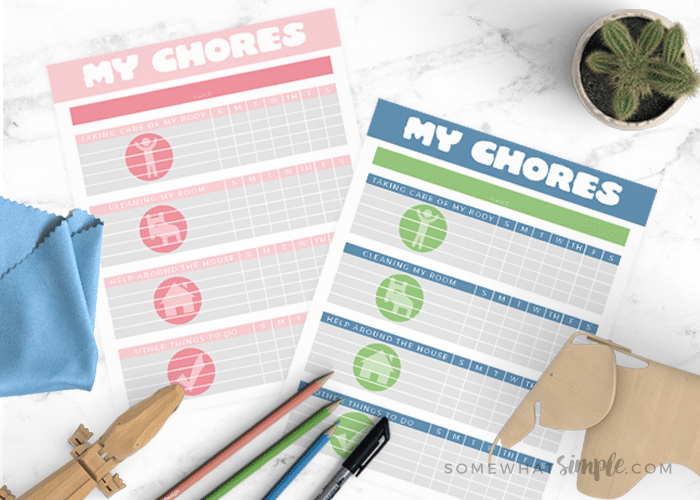 In an effort to help control the mess and to keep their productivity level up, I designed these chore charts for kids that parents can print and change as often as they need to! I have found that itemizing chores for younger kids can really make cleaning more fun. If I have a chart with only 3 things for my kids to do everyday, their chores get boring a lot faster. And that means they don’t finish entire tasks, and then chore charts become useless. With a big list of small tasks, children have more to mark off and they are motivated and also encouraged as they see progress. With this in mind, I made a chart where I could list everything they need to get done every day. And rather than writing clean your room, I list all the tasks that need to be done in their room: make your bed, pick up your toys, put your laundry away, etc. All of their chores are organized into 4 categories – good hygiene, bedroom, home, and misc. tasks to complete. These chore charts have been so successful in my home, I thought I’d share them with you too! First. download and print the chore chart for kids. Then, fill out the chores you’d like your kids to complete. Next, laminate each chart, or place it in a plastic sheet protector. Lastly, display the chart where your kids can access it. Then, let them mark off their completed tasks each day with a dry erase marker. 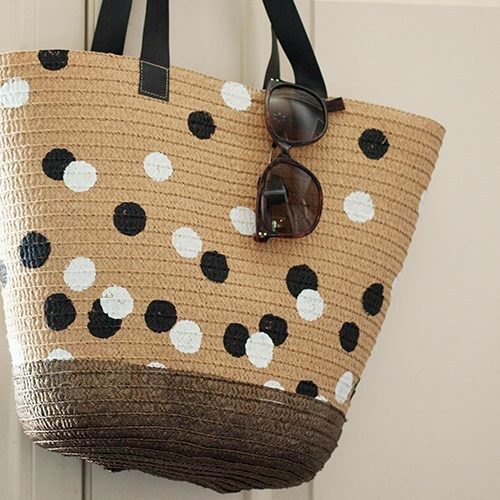 So simple, your house is going to be tidy in no time! 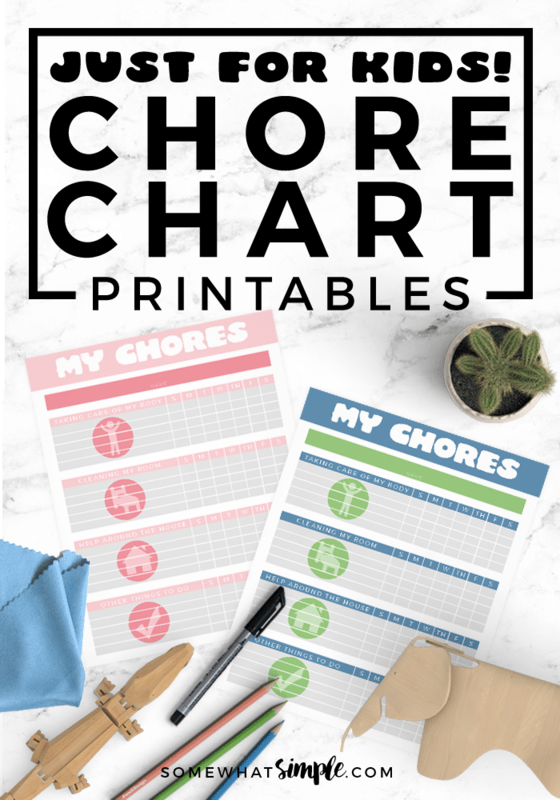 Click HERE to download these Chore Charts today!!! 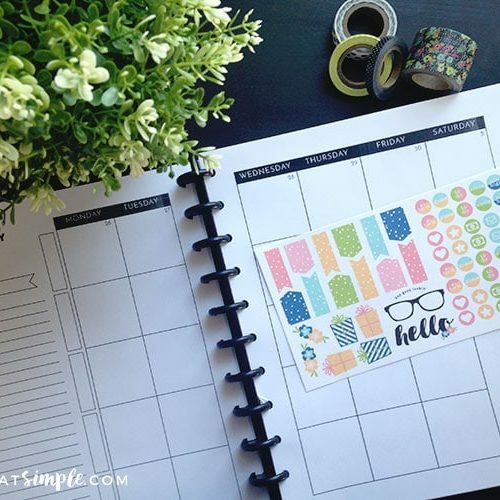 DIY Planner Stickers – Make Planning Fun! I have been looking for a chart that was suitable for the chores that my kidlets do! This is just perfect! I have printed them out and am just about to fill them in. You have made me one very happy Mumma! Love these charts, best ones I’ve seen! However, I have tried downloading them 3 times and nothing happens! Please advise. Thanks! Thanks for sharing these. My little girl has been asking for a chart. This will be perfect! I’d be thrilled if you’d link up at this week’s Off the Hook! I am glad you like these Lauren, thanks for stopping by! Thanks so much! I am so happy that I found these! I have been looking for a good chore chart for both my kids and I really like the way this one is set up. I know my 6 year old will do good with it, I just hope that my 3 year old will as well. I can’t wait to hang them up! I’m glad you like them, thanks for stopping by! It did not print when I downloaded it so I sent it to myself in an email and then it printed properly. Don’t know why it wouldn’t print off the download, I have a Mac, maybe that’s why? Thank you – I have 4 boys so this TOTALLY will come in handy! Love these! I was looking to make a chore chart that included responsibilities too! Thank you. I can’t seem to get the blue page to work. Is there another blue chart source to try? Cute, but what would have been *GREAT* is to have made the fields editable in the PDF. That way, the kids can’t erase it, nor can the complain about legibility. If the chores change, alter the document, print out a new copy. *perfect*. Cute is good, but better when it’s *useful*. 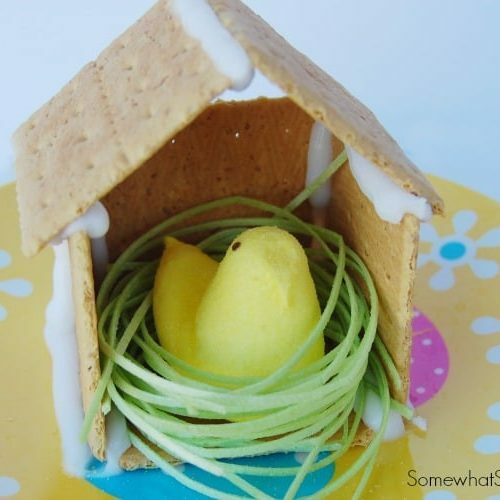 I am so excited to try these with my kids. I have even shared this page with some of my mommy friends and posted the link on Facebook, I hope that is okay. These chore charts are great! Just found them on Pintrist and then found your website. Love everything that I have seen and can’t wait to find out more. 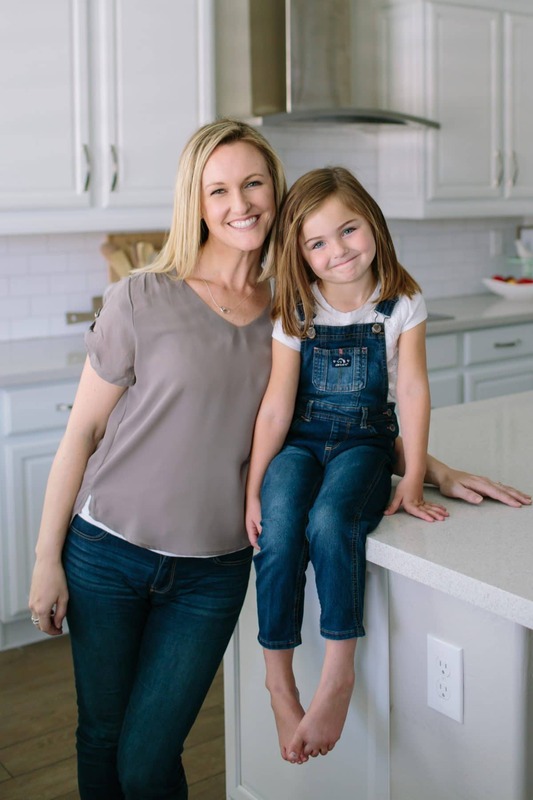 I have two children (ages 7 and 11) and am constantly on the go and seem to not be able to stop the chaos!! Think you have a lot of great tools and things that will help us out!!! Thank You!!! Thanks so much for this great chore chart. It’s just what I’ve been looking for! My daughter loves the act of checking off the chores she’s completed. Any chance you can offer an editable version. I’d like to type in the chores so I don’t have to handwrite them. Thanks so much! I agree! It would be great if we could edit it, so we can re-print it with their chores typed in… I don’t know enough to make one from scratch… Thanks so much! I filled ours in in my best handwriting and then laminated it. You can fill it out every week and then wipe it down for the next week with dry erase markers. You could also laminate the blank chart and use a sharpie pen to fill in the jobs…then if you ever change up the jobs you can use nail polish remover to erase the jobs you want to change. Thanks for these. I’m currently trying to be a bit more consistent with my little girl and her chores. These charts will help immensely. Thanks for sharing! I am being a mean mom this summer and having my kids do things to earn xbox time. You know, because they think it’s a given to play it and not a priveledge. One way they can earn extra time is to read to the youngest brother who can’t read yet! That way he gets their undivided attention, too! This caught my eye because I have too decided that it was time to make my kids earn privileges instead of them being automatically given. And your idea of reading to her younger sibling is an awesome idea that I will be using! Thanks so much! I downloaded and was able to personalize it for my daughter and her new chore list using Photoshop Elements. I’m either going to put in a frame that has plexiglass or laminate and use a whiteboard marker! Wonderful, wonderful idea. I love the way your organized everything so simply. I just laminated the chart and can’t wait to use it. Sometimes charts are great visual aids for kids so they can really see how they are progressing. Thanks for taking the time to do this!! Thanks Amy, I am glad you like them!